Enda Kenny, flanked by some of the Swedish fans and investors that now won’t bother coming to Dublin. The moment the draw for the 2014 World Cup qualifiers was made, I did a little dance. Sweden were drawn against Ireland, and we couldn’t lose – off the pitch at least. For me, the draw meant not just that I would be guaranteed plenty of sports journalism work over the year-and-a-half of qualifying – it meant that we would have a brilliant chance to market Ireland in a non-Euro economy. We would face Sweden in Stockholm in March, with the return leg in Dublin in September. If ever there was an open goal in terms of marketing Ireland, this was it. Sweden, as we know, didn’t join the single currency, and as such it still enjoys relative stability despite the basket case that the global economy has become. Ireland’s state agencies market our products and services here admirably, but two World Cup qualifiers between what were the two best sets of fans at the Euros represented a love-bombing opportunity that couldn’t be missed. I wrote to minister Michael Ring on August 13 2012 to suggest making an extra effort – to perhaps organise some special events or otherwise plan to make the most of this unique opportunity. I mentioned the potential for tourism and commercial travellers, and for bringing Irish and Swedish businesses together to explore opportunities. 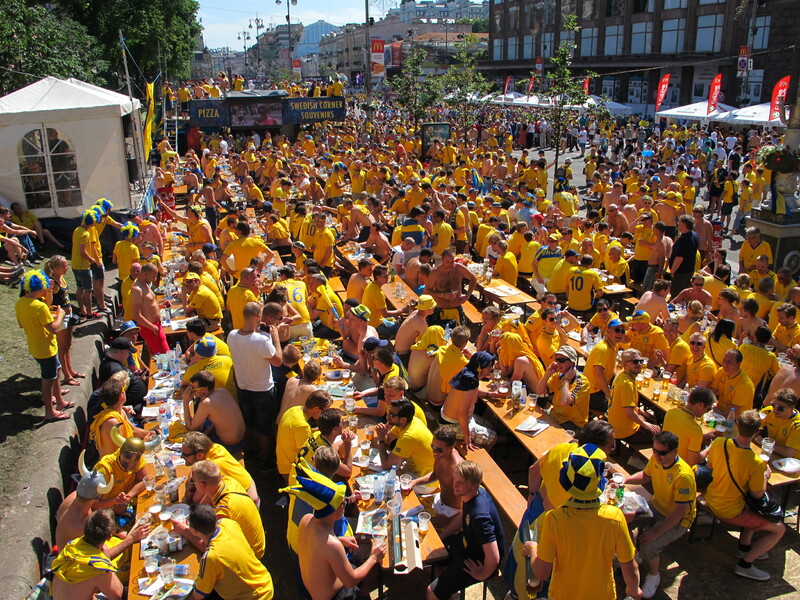 As I saw in Kiev last year, Swedish soccer fans are great tourists. They love beer and craic and they spend money. Their business people are even better – eager to invest, they recognise a good opportunity when they see one. They also have the kind of hi-tech society and economy we would kill for. The e-mail to minister Ring contained very specific ideas for what could be done to exploit the opportunity provided by these games – the first competitive games between Ireland and Sweden for the best part of two generations. The more I wrote, the more excited I got. He must have missed it, because I got no response. I wrote again on August 30, and a member of staff acknowledged receipt of my e-mail. On October 31 I chased it up. On November 16 I was informed that the minister said to tell me that Tourism Ireland were the body responsible for marketing Ireland abroad, and that he had heard I was already in contact with them. In fairness, I was already aware of all that. There was no mention of the other ideas to put together Irish businesses with Swedish investors, no mention of the other ideas contained in the mail. No offer of support. Perhaps fittingly for a minister whose portfolio covers sport, the e-mail was a kick to touch. A call to the minister’s office suggested that I contact minister Richard Bruton instead, as this might be more up his street. So I did. (I also mentioned it in person to minister Lucinda Creighton when we borth appeared on Marian Finucane’s radio show, and to minister Joan Burton when she came to Stockholm to launch the Gathering). I wasn’t going to contact Bruton, even though my family lives in his constituency and I know him to be a decent man. The wheels of Irish bureaucracy turn extremely slowly, and I sincerely doubted his department was going to spring into gear, no matter how decent he is. But then again, I have to practice what I preach – I cannot ask others to do their best to promote Irish business and keep it on the agenda if I’m not prepared to send a simple e-mail myself. So I took a deep breath and contacted both his constituency office and his ministerial office, and waited for the surprise that would never come. I got the standard acknowledgement on November 19, and then what I had come to expect. Silence. Christmas came and went. So did New Year. The Minister has noted the comments made, and has recommended that your email be relayed to the Irish Embassy in Stockholm for advice. Accordingly, I am cc’ing this email to the Office of Mr Eamonn Gilmore T.D., Tánaiste and Minister for Foreign Affairs and Trade, for attention and direct reply to you. Time is running out, and all I got was another kick to touch. The Irish community here isn’t huge, so the embassy here already knows all about me and these ideas. It also deserves great credit for doing a brilliant job with virtually nothing. But they don’t have the resources to help pull off such a comprehensive effort, which was the whole reason for contacting ministers directly. So instead of our dynamic, youthful, jobs-obsessed government leaping into action, nothing happened. There are now a little more than two months to go the Sweden – Ireland game in Stockholm, and whatever chance we had of organising anything meaningful to promote Irish business during these two unique games is now gone. Last February, Simon Coveney invited me in to his office, where he thanked me and the Swedish-Irish community for our efforts and our patriotism. He also said not to hesitate to contact the various ministers if we thought we could do anything to help promote Ireland abroad. We did, and nothing happened. The question remains – why was no effort made to even gauge the scale of what could be done against the backdrop of the soccer games? I can’t find any other explanation for this wonderful episode (which I have now dubbed “The Dithering”), so my guess is money. Namely, the Irish government doesn’t have any, and what little it has is not going to be spent doing something daft like making a cross-functional effort to promote Ireland abroad. Sure we already have the Gathering and Arthur’s Day, what more do we need? And maybe they’re right. Sweden as a market is probably being seen as insignificant compared to say, China or the US. 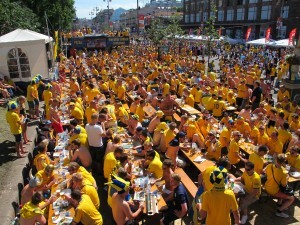 But are the tourism euros of 5000 Swedish football fans worth any less? Are the euros of Swedish investors looking for projects worth any less? Are the jobs that could be created by those euros worth any less? As a result of austerity, what Ireland now has is a one-size-fits-no-one economic and marketing policy. There is no room for anything different. There is no room for deviation. There is a simple, grim realisation that being different or deviating from what is already prescribed is neither desirable nor possible. It goes against all I ever learned about sales and marketing – about taking the easy deals (the so-called “low-hanging fruit”), about exploiting the opportunities fate dumps in your lap. At a time (March 17-22) when Ireland is never going to have a greater media profile in Sweden, our collective government answer is to do nothing. There is a happy ending to all this, of course. Despite the disappointment, the Irish community in Sweden will no doubt continue to wear its green jersey, both figuratively and literally. We will continue to promote Ireland as a tourist destination (including to Swedish soccer fans), as a place to do business, as a country of wonderful culture and people and sport. We will continue our efforts to organise as many events as possible as part of the Gathering, and for any other initiative you care to mention. But the next time a minister calls on us to show our loyalty and patriotism, he or she may well be ignored. Because patriotism is something for us all, and loyalty is a two-way street.